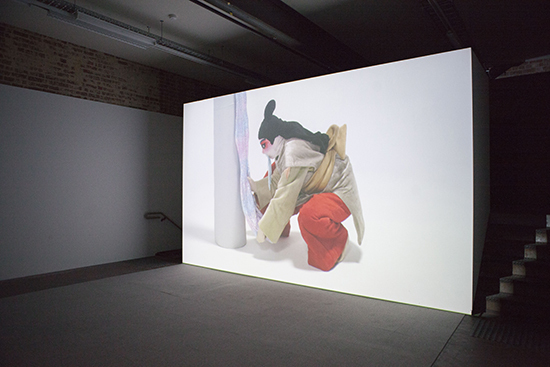 At one point in Fanni Futterknecht’s video Across the White, a character moves across the screen stating, “when I walk to the left, your eyes follow me to the left and when I walk to the right, your eyes follow me to the right.” The scene neatly demonstrates how we view a performance on a screen compared with seeing one live, a distinction that is explored in the group exhibition, The Screen as a Room, at The Substation. Curated by Nikki Lam, it brings together video works by Eugenia Lim, Christian Thompson, Mira Oosterweghel, Fanni Futterknecht and Caroline Garcia, alongside opening and closing night performances by Garcia and Oosterweghel. In ensuring that nobody questions his “composition,” he overlooks the complexities of the works he’s arranging. The woman who alters the sculptures invigorates them by literally pulling shapes like shimmering silver tongues or pale pink spikes from their insides. As she draws out each one, “to deliver itself from its form,” her act implies deliverance, not only from within the sculptures, but from the strictures of the camera that the artist-curator represents. 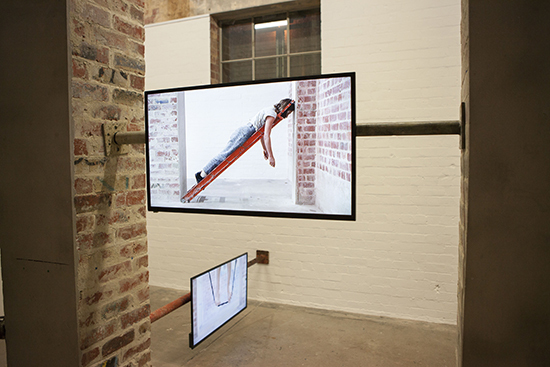 Responding to surface and shape in a completely different way, Mira Oosterweghel’s videos, Holding a Point, show her suspending herself for as long as she can between brick pillars in the gallery. In her works, immovable architecture not only supports the body, but the screens themselves, as each one is fastened on a steel pipe, squeezed between the walls and held there only by pressure. In another room, a video of Caroline Garcia twerking in a skirt strung with banana peels is projected on a wall. With the recording sped up slightly, we see her whipping the skins about her waist until all of them have fallen. The skins—now black and shriveled—are to be found on the floor of the room in which the video plays, revealing this is where the performance took place. 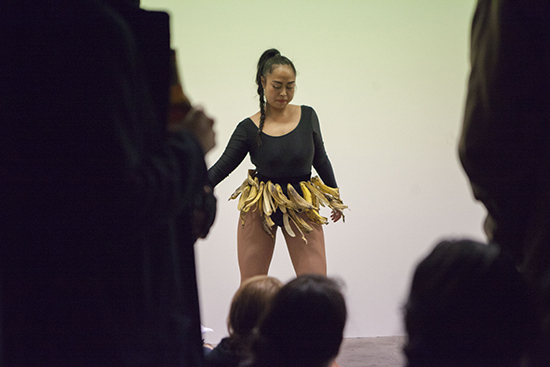 Titled Plantation Dance (Reprise), Garcia’s work references Josephine Baker, the black American star of the 1920s Paris theatre world, and the exploitative practices of Chiquita Brands International, the American banana market corporation. Using the empty banana skins, Garcia strips away the value of the fruit and, in turn, the brand’s remodelled image [the company was prosecuted in 2007 for bribing terrorists to protect its interests in Colombia -Eds]. The skins, as traces, create a compelling middle-ground between live action and documentation. Blurring these distinctions, Christian Thompson’s three-channel video, Heat, shows the faces of three young Indigenous sisters, each framed in front of a pale orange background, sweating and being buffeted by wind. Or is it air from a fan? Using the simulation of a desert environment to blur fact and fiction, Thompson subtly questions the discrepancies between performance and screen. If I start thinking about the constant expansion of infinity, other than getting a headache I might imagine room for spontaneity and, more importantly, room for potential. The closing event for The Screen as a Room was Oosterweghel’s performance The Conditions Were Simply Perfect to Catapult into Infinity. It hinted at the potential for change in a situation designed to thwart it. Performed by a collaborator, The Conditions… comprised eight cement blocks placed one by one at the end of a see-saw like structure while the performer balanced at the other end. As the disproportionate weight increased, the wooden plank holding the tension warped enough to unnerve me. Eventually, the performer curled around one end in the air, throwing her weight into the effort. The other end lifted slightly, then lowered with repetitive thuds as it hit the ground. When the potential for radical change—a catapulting into infinity—is fixed to fail from the beginning, the performer can only aim to usurp the inevitable for so long. 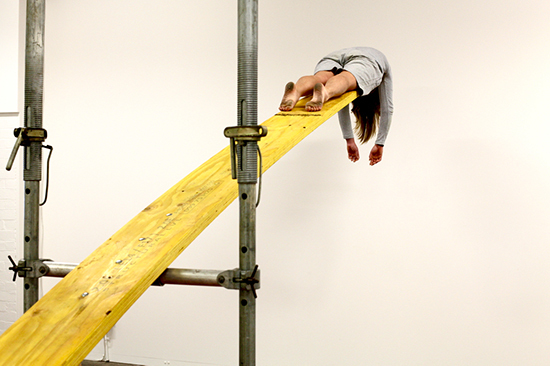 As the performance ends with the performer lying on the raised plank, her arms dangling over the end, the title accrues a sarcastic ring. Evident in everybody’s hesitancy to leave the room or talk once it had finished, The Conditions… controlled the space in an uncomfortable way. Perhaps accentuated by the performer’s plain grey uniform and sombre mood, The Conditions… lacked casualness or the openness that I prefer to see in performance. Behind the black ropes hanging in front of a stairwell and down into a cave-like room covered in black tarp is Eugenia Lim’s video installation, Nest 2011. Exploring Japanese mythology and the phenomenon of hikikomori—a condition in which people stay in their rooms subsisting on computer entertainment while being fed by their family—Lim creates an isolated space in which the focus of our attention is the screen. The video shows Lim’s collaborator, butoh performer Yumi Umiumare, dancing erratically as if acting out the anxieties that come with screen-based isolation. In this dark nest, fixed on the screen, we too take on the role of a hikikomori addict and dissolve the boundaries between screen and performance.